For the 2005 film, see DragonBlade: The Legend of Lang. Dragon Blade is a 2015 Chinese-Hong Konger historical action film written and directed by Daniel Lee and starring Jackie Chan. In the film, Chan plays Huo An, the commander of the Protection Squad of the Western Regions during the Han Dynasty. Dragon Blade was released in IMAX 3D on 19 February 2015, the first day of the Chinese New Year holiday period. The film was released in the United States on 4 September 2015 by Lionsgate Premiere. In northwest China, 48 BC (50 BC on screen in the English version), a security company under Han China's current government called The Silk Road Protection Squad is committed to stopping battles and promoting the idea of peace. Huo An (Jackie Chan), the captain, successfully averts a battle between the Indians and Han Chinese. The group returns to their unnamed home city, where Huo An's gentle Uyghur wife Xiuqing (Mika Wang) serves as a schoolteacher for orphans. However, the government uncovers evidence that someone in the group is corrupt, causing the entire group to be sentenced to construction work at Wild Geese Gate, a ruined fortress. Once they arrive, the group pays respects at the shrine of a fallen Chinese general. They originally were child-slaves of Han descent, but the general had later rescued them. Not long after, Wild Geese Gate is threatened by a legion from the Roman Empire in need of water and supplies, among which is a blind boy named Publius (Jozef Waite). After a stale-mated duel between Huo An and Lucius (Cusack), the Roman general, the latter agrees not to assault the city in return for being let inside. The legion uses its superior engineering skills to speed up the construction work, an act which boosts the morale and happiness of the inhabitants, who are divided among several different ethnic groups, such as Chinese, Uyghur, and Turkic. Huo An returns the favor by sending men to assist Lucius's envoys in reaching the Parthian Empire. A celebration is later held and Huo An is made an honorary centurion. Lucius reveals that he and Publius are fleeing from Publius's brother Tiberius (Brody), a corrupt soldier who murdered their father, a Roman consul, and blinded Publius so Tiberius could become consul. As Tiberius approaches with 100,000 soldiers, Huo An insists on helping Lucius, pointing out that Tiberius is a threat to the Silk Road in its entirety. Shortly after Huo An leaves to find reinforcements, the corrupt group member from earlier sends Chinese soldiers to murder Xiuqing and attack Wild Geese Gate. The legion is imprisoned in the non-Chinese trading city of Kroran, where Tiberius has chosen to camp. Tiberius proceeds to murder Publius. Huo An and the few loyal Chinese soldiers travel to Kroran, pretending to surrender, but once they are inside, they destroy the Roman legion's cages. Huo An breaks into Lucius's special solitary cell, but is unable to free him. A fire breaks out, whereupon Lucius calls out to Huo An to 'take me home', and Huo An shoots an arrow to kill Lucius before the fire gets him. As Huo An's and Lucius's soldiers are surrounded, the armies of several other nations arrive and fight against Tiberius, including the Indians, Han, Uyghurs, and Turkics, all of whom are determined to preserve the Silk Road's safety. However, even their combined forces are unable to gain the upper hand. Finally, the envoys from earlier return with a massive host of Parthians, who had signed a special treaty with Publius's father and who intend to avenge his memory. Tiberius's soldiers lose their will to fight. Huo An challenges Tiberius to a duel and kills him. Upon hearing about the bravery of Lucius's legion, the Chinese emperor grants them the right to establish their own city, which they choose to name Regum. They accept Huo An as their commander, and Huo An, in turn, honors the deceased Chinese general by relocating the shrine to that city. As the centuries go on, the city fades from collective memory. However, in the modern day, a team of Asian American archaeologists stumble upon the site and uncover the dual Chinese and Latin inscriptions. Ultimately, the role went to John Cusack. Principal photography for Dragon Blade started on 15 April 2014 in Hengdian, China with some battle scenes. The cast and crew encountered difficult filming conditions due to the heat, their heavy costume and long filming hours. Two days later, a press conference for Dragon Blade was held at the Beijing International Film Festival where star Jackie Chan and director Daniel Lee attended and announced the film to be released in IMAX 3D on 19 February 2015, the first day of the Chinese Lunar New Year. Aside from Hengdian, production took place in Dunhuang and the Gobi Desert. The film was shot with a budget of US$65 million. The film was financed by Sparkle Roll Media Corporation, Huayi Brothers Media Corporation, Shanghai Film Group, Home Media & Entertainment Fund, Tencent Video and the Beijing Cultural Assets Chinese Film and Television Fund. A signing ceremony for the launching of Beijing Cultural Assets Chinese Film and Television Fund also occurred there as Dragon Blade is the first film to receive an investment from the fund. International distribution of the film outside of China was handled by Golden Network Asia. Dragon Blade was a commercial success in its native country, China. It opened Thursday, February 19 in China and grossed US$18.7 million on the opening day. Through Sunday, February 22, it had a 3-day opening weekend total of US$33 million, topping the Chinese box office (US$54.8 million from Thursday - Sunday) from 132,874 screenings and 8.14 million admissions. Through its opening week it earned US$72 million. The film fell to number three the following weekend, earning US$45.9 million (down 19%). As of March 15, 2015, Dragon Blade has earned US$120 million in China alone. Dragon Blade has received mixed reception, with much of the praise directed towards its large-scale battle sequences, production design, and mixing of styles from both Hollywood and East Asian cinema. On review aggregator website Rotten Tomatoes, the film has a 34% approval rating and rating average score of 4.3/10. The site's consensus reads, "Dragon Blade is beautifully staged and choreographed, but between the battles, its talented cast is overwhelmed by a dull story and choppy editing." Variety's Maggie Lee applauded the film for its overall technical details and concluded it to be "a colossal entertainment with solid technique and terrific storytelling smarts". Clarence Tsui of The Hollywood Reporter complimented Dragon Blade for its filmmaking quality and screenplay for a primarily mainland Chinese production. IGN awarded it a score of 6 out of 10, saying "The story is rubbish, but Dragon Blade has some cool fight scenes thanks to Jackie Chan's action direction." In a negative review, Gabriel Chong from MovieXclusive.com panned Dragon Blade as being "utterly awful in every respect", criticizing the performances of the starring cast and inconsistent changes in tone. He writes: "Indeed, Dragon Blade is a hot mess and a spectacular misfire, not just by its star but also by its director, and if anything, further confirms that the once-promising careers of Hollywood stars John Cusack and Adrien Brody are going the way of Nicolas Cage". Indian media gave overwhelmingly negative review on the movie. Claiming the movie to be "a Chinese propagandist film", The Hindu's Venky Vembu criticized the film's lack of subtle messages and disapproved of the characterizations, writing: "I watched this film in 3D, but given the two-dimensional nature of the cardboard characters, I don't think the third D would have vastly enhanced my view experience." IANS also labeled the film as "Chinese torture", but did commend the film for its action choreography and Jackie Chan's performance as the Chinese General Huo An: "With ample footage in action and emotional scenes, [Huo An] is one of the best characters Chan has portrayed in recent years." The first undisputed contact was much later, in 161 AD. An embassy from Roman Emperor Antoninus Pius or his successor Marcus Aurelius reached the Chinese Emperor Huan of Han at Luoyang. ^ a b c "Shanghai Film Fest: John Cusack, Adrien Brody to Star in Jackie Chan's 'Dragon Blade'". The Hollywood Reporter. June 15, 2014. Dragon Blade is backed by Sparkle Roll Media Corporation, Huayi Brothers Media, Shanghai Film Group, Home Media & Entertainment Fund, Tencent Video and Beijing Cultural Assets Chinese Film and Television Fund. ^ a b c "Jackie Chan's 'Dragon Blade' Cuts Deal With New Fund". The film’s budget is claimed to be a record for a Chinese-financed movie. The film is backed by Sparkle Roll Cultural Media, Huayi Brothers Media Corporation, Shanghai Film Group and new film investment group Beijing Cultural Assets Chinese Film & Television Fund. ^ a b "Jackie Chan's 'Dragon Blade' Set For IMAX Chinese New Year Outing". ^ "'Dragon Blade' gives Adrien Brody chance to explore his action side". Archived from the original on 20 February 2015. ^ "DRAGON BLADE (15)". British Board of Film Classification. 1 December 2015. Retrieved 1 December 2015. ^ "Dragon Blade (2015)". Turner Classic Movies. Turner Broadcasting System. ^ "Dragon Blade (2015)". AllMovie. All Media Network. ^ "How action movies gave rise to Jackie Chan's booming second career". New York Post. 2015-08-29. Retrieved 2015-09-04. ^ a b Clifford Coonan (April 3, 2015). "China Box Office: Theater Takings Rise 40 Percent in First Quarter (Report)". The Hollywood Reporter. Retrieved April 3, 2015. ^ Maane Khatchatourian (2014-12-27). "Watch: Jackie Chan, John Cusack Face Off in 'Dragon Blade' Trailer". Variety. Retrieved 2016-06-17. ^ a b c "六十歲成龍「奉旨出征」 《天將雄獅》定檔羊年賀歲". ^ Evry, Max (2015-06-22). "New Trailer for Dragon Blade, Starring Jackie Chan and John Cusack". ComingSoon.net. Retrieved 2016-06-17. ^ a b "John Cusack, Adrien Brody Join Jackie Chan's "Dragon Blade"". 2014-06-18. ^ "EXCLUSIVE: French singer to star in Jackie Chan's next". The Movie Planet. 2014-06-30. ^ "Jackie Chan Teams Up With Mel Gibson and Siwon For "Dragon Blade"?". ^ a b "John Cusack, Adrien Brody join Jackie Chan's Dragon Blade". Screen International. 15 June 2014. Retrieved 19 June 2014. Dragon Blade is financed by Sparkle Roll Media Corporation, Huayi Brothers Media Corporation, Shanghai Film Group, Home Media & Entertainment Fund, Tencent Video and Beijing Cultural Assets Chinese Film and Television Fund. It is the first film to receive financing from the newly-formed Beijing Cultural Assets Chinese Film & Television Fund. ^ Ian Philips (March 6, 2015). "This movie starring Jackie Chan, Adrien Brody, and John Cusack is huge in China right now". Business Insider. (Owner Business Insider Inc.). Retrieved May 3, 2015. ^ "Dragon Blade leads Lunar New Year box office". Film Business Asia. February 20, 2015. ^ Nancy Tartaglione (February 23, 2015). "'Fifty Shades' Strong At Overseas Box Office; Chinese New Year Festive For 'Kingsman' – In'tl B.O.Update". Deadline Hollywood. Retrieved February 24, 2015. ^ Patrick Frater (February 23, 2015). "Jackie Chan's 'Dragon Blade' Scores $55 Million to Head China's New Year Box Office". Variety. Retrieved February 24, 2015. ^ Clifford Coonan (February 23, 2015). "China Box Office: 'Dragon Blade' Dominates Lunar New Year Holiday". The Hollywood Reporter. Retrieved February 24, 2015. ^ Nancy Tartaglione (February 26, 2015). "Lunar New Year Box Office Sets China Record; 'Kingsman' Royal In Korea: Update". Deadline Hollywood. Retrieved February 26, 2015. ^ Patrick Frater (March 2, 2015). "China Box Office: 'Man From Macau,' 'Wolf Totem' Hit Top in Second Holiday Week". Variety. Retrieved March 3, 2015. ^ "Tian Jiang Xiong Shi (Dragon Blade) (2015)". Rotten Tomatoes. Retrieved September 4, 2015. ^ Maggie Lee (26 February 2015). "File Review: 'Dragon Blade'". Variety. Retrieved 20 June 2015. ^ Clarence Tsui (26 February 2015). "'Dragon Blade'('Tian Jiang Xiong Shi'): Film Review". The Hollywood Reporter. Retrieved 20 June 2015. ^ "Dragon Blade Review - IGN". Uk.ign.com. 2015-09-03. Retrieved 2016-06-17. ^ Gabriel Chong. 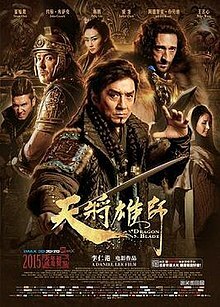 "DRAGON BLADE(天将雄狮)(2015)". MovieXclusive.com. Retrieved 20 June 2015. ^ Venky Vembu (28 March 2015). "Dragon Blade: The rebranding of Jackie Chan". The Hindu. Retrieved 20 June 2015. ^ "'Dragon Blade' - A Chinese torture, lost in translation (IANS Movie Review)". Business Standard. IANS. 27 March 2015. Retrieved 20 June 2015. ^ Dubs (1941), pp. 322–330.